Slovenians receiving pension from Slovenia will no longer receive written notification. Slovenci, ki dobivajo slovensko pokojnino ne bodo več prejeli pismenega sporočila. Organize social activities, outings and Bus trips as per requirements. Our office is open every Sunday (except second) after a mass, from 11am to 12pm, at address 19 A’Beckett Street , Kew. Office is also open every first and third Thursday in a month from 10am to 12pm, by appointment only. The first to take the initiative to establish this constitution was Mrs Helena Leber at a meeting of Slovenian community in the Hall of Cyril and Method in Kew on 26 November 2003. She invited to the meeting all representative members of Slovenian community. At that meeting she indicated a pressing need for welfare and strong needs for health and social help for people who do not know where to get help. Approximately 90 people attended that meeting and majority of Slovenian clubs and media supported the idea. They held a few meetings but things did not move ahead. 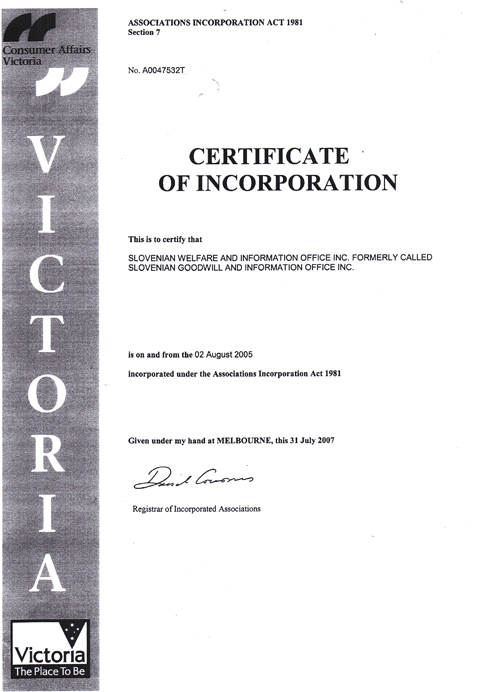 In 2005, the matter was taken in hand by Mr Peter Mandelj, President of Council of Slovenian Organizations of Victoria. He consulted with Slovenian Club Presidents and some other important people who supported idea about welfare for Slovenian community. On 28 January 2005 the inaugural meeting was held to establish the Slovenian Welfare Office. The meeting were attended: Mr P. Mandelj, Fr C. Božič OFM, Mrs S. Čeferin, Mr and Mrs S. Srnec, Mr F. Toplak, Mr and Mrs M. Ogrizek, Mr J. Caf, Mr and Mrs R. Crooks, Mr S. Penca, Mr R. Carmody, Mr L. Lenko and Mrs M. Lenarčič. Mr P. Mandelj was elected as the Chairman. The constitution was established. On the following meetings the Management Committee elected functionaries, prepared and accepted rules, started procedure about incorporation, applied for financial help, supplied office equipment, telephone line and determined working hours. Office was open May 2005 at Slovenian language class room, Baraga house Kew, every Tuesday from 11am until 3pm with supervision by Mrs S. Crooks, Mrs Z. Pertusio, Mrs L. Srnec and later Mrs S. Gorup. At this social gathering people listened to Slovenian music, played cards, working craft, knitted, crocheted or just chatted.